Who’d have realised that from each tree can come so many different veneers? It’s certainly the case for many trees: the way the logs are cut and of course the different species that come under each genus result in an array of different effects. Over the years as wood veneer specialists we’ve found that not so many people appreciate that there are so many different effects that can be achieved from the same tree. 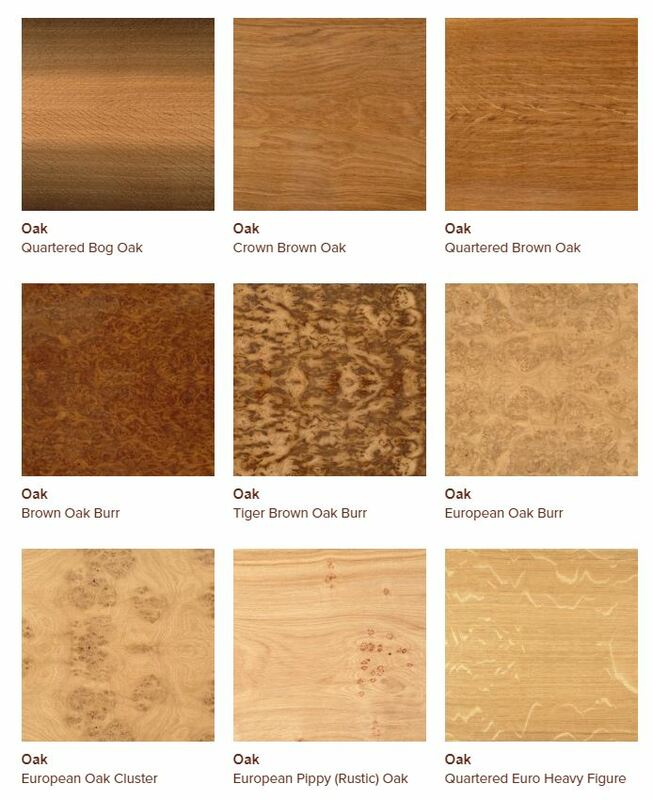 Take oak for example, did you know there were at least 20 different natural wood veneers that can be derived from the Quercus genus, all of them presenting a diverse array of features. 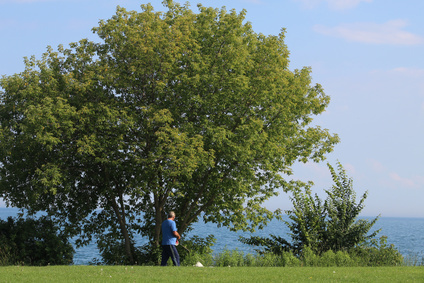 So, we thought it would be interesting to take a look at the different trees and their many veneers, starting with two much admired favourites: mahogany and maple. Maple, of the genus Acer, is one of the most popular trees used in furniture making. This is thanks to its hard, high density timber which presents a rich colour and silky lustre, making it ideal for carving and wood turning. 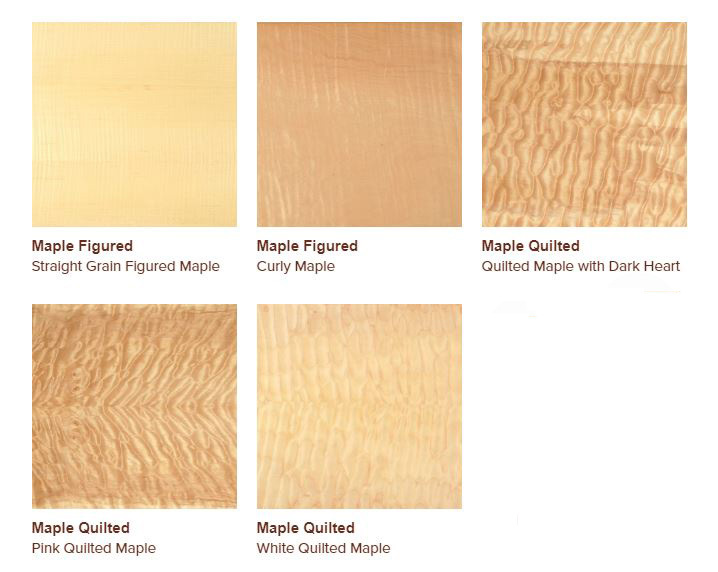 Maple is also commonly used in the crafting of musical instruments, in particular harps. Because it polishes to a beautiful sheen and when sliced displays highly attractive, elegant patterns, maple makes an exceptionally sought-after veneer. 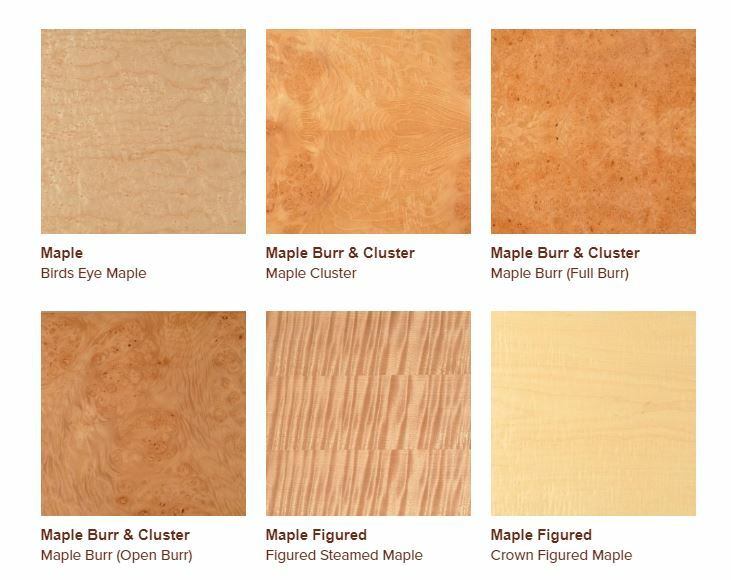 Our veneers A-Z lists eleven different maple options, including maple burr and cluster (either cluster, full burr or open burr) which has something of an exclusive appeal and is often used by master cabinetmakers to produce exceptional effects in top of the range bespoke kitchens and fitted furniture. Quilted maple also makes an extremely attractive veneer and can be either ‘pink’ (a rosy beige); ‘white’ (a buttery cream) or dark heart. Birds eye maple is widely used as inset panelling in sophisticated furniture lines, and figured maple is particularly striking, especially when applied in a contemporary setting. There are nine mahogany veneers listed on our A-Z, all of them rich and golden bronze in colour, and all striking in effect. 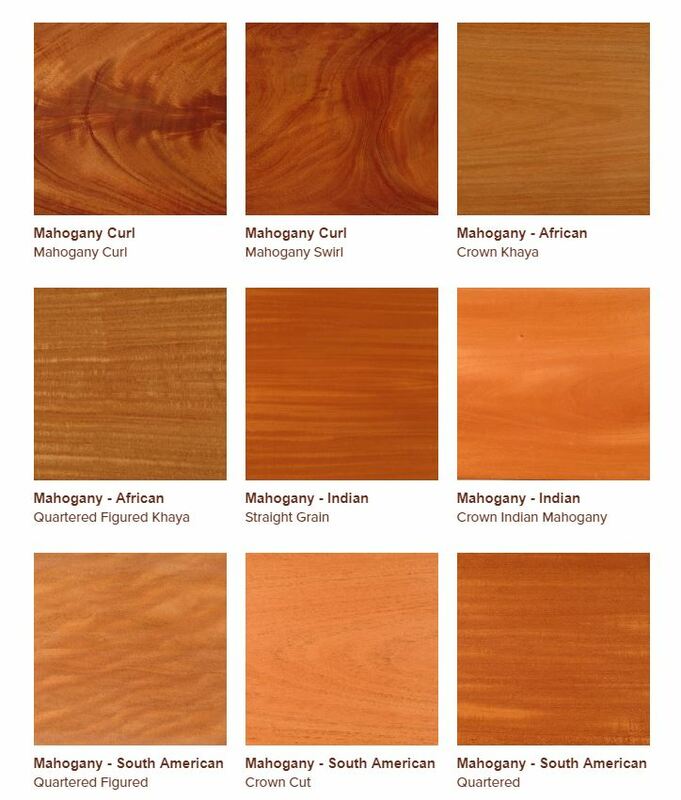 There are actually many different species of trees that are referred to as mahogany, but ‘genuine mahogany’, of the Latin Swietenia macrophylla and also known as South American mahogany, Honduran mahogany, big-leaf mahogany or West Indian mahogany is guaranteed to provide the necessary stability and favourable finishing properties for the purpose of furniture making. Found in Central or South America, genuine mahogany ranks amongst the finest cabinetry timber in the world thanks to its work characteristics including cutting, sanding, turning and shaping. African mahogany (Khaya ivorensis) is native to West Africa. The timber from this species is consistent in texture, colour and grade and presents an extremely lustrous grain appearance. It looks quite different from genuine mahogany in that it presents an interlocking style of grain but its beauty means it is much sought after by high end furniture makers. Indian mahogany (Swietenia mahogany) is commonplace across all of India. Vibrantly red in colour, it is another very popular choice for high end, bespoke furniture makers and much requested where a bold, colourful statement is the order of the day. So there you have an insight into two of the most popular timbers used in natural wood veneering. Look out for more insights over the next few months as we take a look at more of the tree world’s wonderful gifts. If you are looking to incorporate natural wood veneers into your furniture or interior design projects, you are welcome to get in touch with Read Veneers for expert advice on selecting timber species as well as cutting and matching methods to help you achieve the perfect finish.